Located at the northern most point of the Texas Hill Country, our property is easily accessible from the DFW metroplex as well as Waco and Austin. Skybox Cabins consists of 50 acres of native live oaks and cedars and a seasonal creek that feeds into the Paluxy River. Our 5 horses, 3 cows, 2 dogs and 1 cat roam the property and love to visit with guests. With the Dinosaur Valley State Park boundary less than a mile away, views of nature are endless and the cabins' balconies provide the perfect spots for viewing sunrises, sunsets and countless stars in the night sky. Launched in June of 2017, the Birdhouse is our original cabin. This treehouse inspired cabin features a second floor entry via a bridge from a tree top platform. Using cedar from our property, the interior stairs and railing were all cut and placed by Yvan. 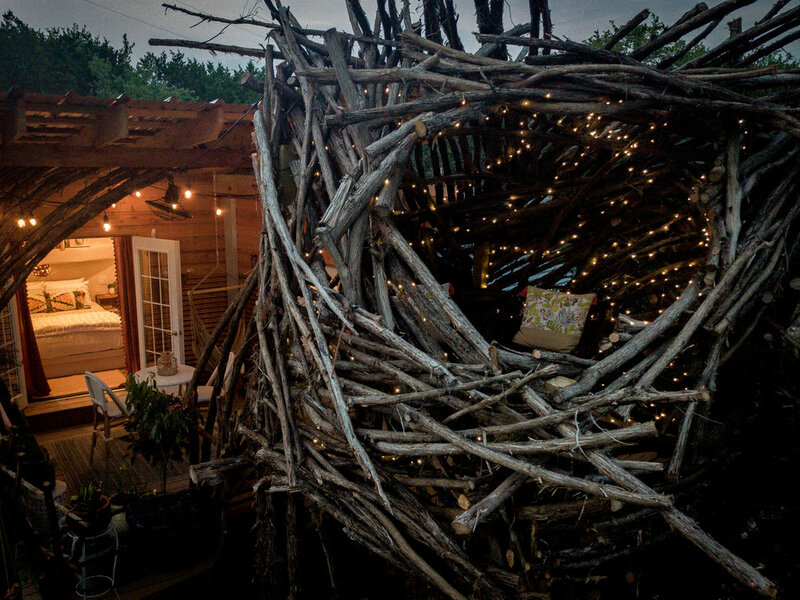 The Birdhouse also features a second floor balcony, small kitchenette, and outdoor fire pit with stone seating. Located on a ridge and surrounded by two large red oaks, La Tour opened in July of 2018. The design was born from conversations that Yvan had with his grandfather about the 17th century French Pigeonniers. The rustic exterior is balanced with a industrial but warm interior. Guests will enjoy two balconies, indoor/outdoor eating options, and a kitchenette with amenities that are perfect for those looking for a longer stay. The Camp was designed and built to accommodate all levels of campers from novice to experienced. Located right off the creek, The Camp consists of two covered platforms. The sleeping platform provides campers with two cots, mosquito netting and can be completely enclosed by hanging canvas. The second platform holds a sink with running water, propane cooktop and cooking utensils, heated shower and compost toilet. Campers can enjoy s'mores on handmade cedar benches by the fire pit, meals on the picnic table and horse shoes in The Camp's "backyard."